DALLAS, TX--(Marketwired - Nov 27, 2017) - Texas new home sales are up, prices are down, and they sold a little faster in October, according to HomesUSA.com® New Homes Sales Index and other data released today. The Index is 12-month rolling average of the Days on Market for new homes listed in the local Multiple Listing Services (MLSs) for the four largest Texas markets, including Houston, Dallas-Ft. Worth, Austin and San Antonio. The pace of new home sales improved in all of these markets but Houston, according to the HomesUSA.com Index for October. 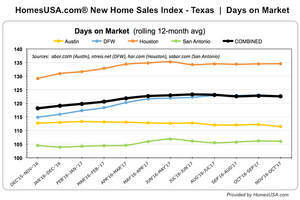 The Days on Market averages were down from September in Dallas-Ft. Worth, Austin and San Antonio. In Houston -- the largest new home market in Texas -- the average Days on Market for new homes increased from 134.51 days in September to 134.57 days in October. In Dallas-Fort Worth, the Days on Market decreased from 123.06 days in September to 122.65 days in October. The Days on Market in Austin had the greatest decrease of the four markets, dropping from 112.21 days in September to 111.44 days in October. San Antonio's new home sales pace also quickened slightly, as the Days on Market decreased from 106.17 days in September to 106.06 days in October. Ben Caballero, owner of HomesUSA.com and the number one real estate agent in the U.S., notes the Texas data he released today is largely in alignment with the Commerce Department's announcement today on New Home Sales for October, which reported new home sales were up 6.2 percent nationally from September. He also notes that we may be seeing signs of the impact of Hurricane Harvey seep into Houston's housing numbers. 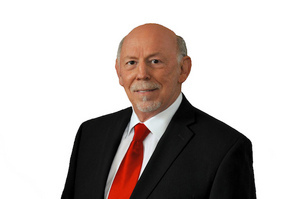 "As we head into the winter, we have yet to see the seasonal impact on new home sales, but we may be seeing some signs of Hurricane Harvey's impact in Houston," said Caballero. "For builders and buyers, it looks like a merry holiday season. New home sales are continuing at a record pace, and buyers are benefiting from new home prices that are a little lower," he added. In Houston, the average new home sales price dropped from $363,657 in September to $362,006 in October. In Dallas-Ft. Worth, the average price dropped from $383,905 in September to $383,112 in October. In Austin, the average price dropped from $379,922 in September to $378,444 in October. And in San Antonio, the average price in October is $291,320, down from $291,778 in September. In all four of the Texas major housing markets, new home sales continue to show record strength. The rolling 12-month average of home sales in these markets increased from 3,226 in September to 3,249 in October. That's according to data compiled by HomesUSA.com from local MLS and trade associations, including the Houston Association of REALTORS®, North Texas Real Estate Information Systems, San Antonio Board of REALTORS® and the Austin Board of REALTORS®. According to HomesUSA.com, based on a 12-month rolling average, Houston posted new homes sales of 1,166 for October, up from 1,156 in September. Dallas-Ft. Worth posted sales of 1,085 in October, up from 1,076 in August. HomesUSA.com New Homes Sales Index for October shows the pace of new home sales improved in Dallas, Austin and San Antonio, but not Houston.